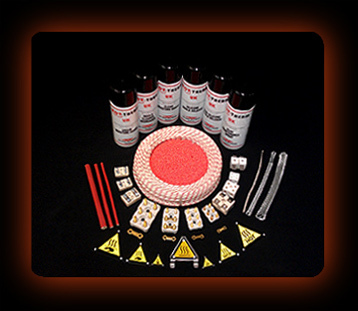 HOTSET UK stock a wide range of Mould Shop Accessories which are all available for immediate despatch. 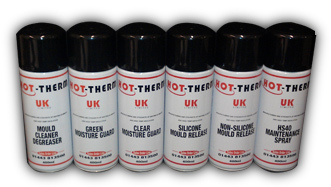 Our own brand of Hot-Therm® Mould Shop Sprays consists of, Mould Cleaner Degreaser, Silicone Mould Release, Non-Silicone Mould Release, Green Moisture Guard, Clear Moisture Guard, and HS-40 Maintenance Spray. Data sheets available on request. We stock a wide variety of Glass Fibre Cable ranging from 2.5 amp through to 40 amp Cable. Designed to operate at temperatures up to 320° C. Supplied on 100 mtr rolls or supplied by the metre. We hold a large range of Terminal Blocks for single and three phase connections which come in a variety of types from Post Terminals, Buzz Bars and Through Connectors with a range of ampage ratings. We stock large quantities of type "J" and type "K" Thermocouple Cable with Stainless Steel Overbraid.